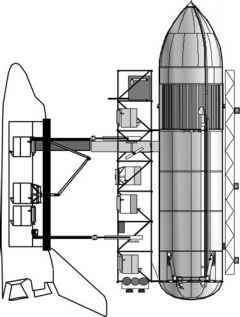 The lunar launcher that delivers and returns payloads from low lunar orbit (LLO) requires propellant to reach LLO and return to the surface. We have said already that nominal orbital speed is much lower than that for Earth, 1,656 m/s (5,433 ft/s), and requires a much smaller mass ratio to reach and return from LLO; the nominal escape speed is 2,342 m/s (7,683 ft/s), or about one-third of the Earth nominal LEO speed. From Table 6.3, we see that the mass ratio to reach LLO is 1.82, or about 3.5 for a round trip back to the surface. This is a modest mass ratio, but all of the propellants must be delivered from Earth, at a very high cost in expended propellant (see Chapter 5), unless propellants can be manufactured in situ. This provides an opportunity for a non-conventional launch capability, solving the difficult operational problem associated with using Earth to function as a launcher to LLO. The lunar surface acceleration of gravity is 1.618 m/s2 (5.308 ft/s2), so the weight of the equipment is one-sixth what it is on Earth: the force required by construction equipment is less, as it the materials strength requirements. Humans on the Moon will still be limited by having to work in pressure suits when outside, and in environmentally controlled habitats and facilities.